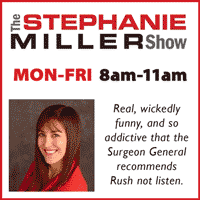 Irreverent, shameless, and not afraid to cross the line, Stephanie’s wit draws listeners from all sides. The daughter of Barry Goldwater’s 1964 Republican presidential running mate, Stephanie’s got politics in her blood. It’s the only show where you’ll find interviews with Bill Clinton and John McCain interspersed with impressions of Kim Jung-Il singing “I’m So Lonely.” …It’s so funny it hurts.